This podcast is designed to present the key reasons for the breakout of World War 2 by explaining the different impacts of Hitler’s aims and actions, the policy of appeasement, the problems caused by the peace treaties, the Nazi-Soviet Pact and the failures of the League of Nations. The first part of the podcast deals with Hitler’s aims: abolish the Treaty of Versailles, expand German territory, and remove the threat of communism. It explains how his policies were designed to fulfill these aims. Key actions from the first years of Hitler’s Chancellorship that are described include: rearmament, remilitarisation of the Rhineland, his role in the Spanish Civil War, and Anschluss with Austria. The podcast then goes on to assess appeasement. Arguments in favour of, and against, the policy of appeasement are presented. 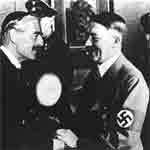 This is followed by an explanation of the Sudetenland Crisis, the Munich Agreement and the Nazi-Soviet Pact. The views of historians are considered. This episode concludes with a brief explanation of how to answer an examination question on this topic. This podcast aims to look at three key areas – why the alliance between the USA and the USSR broke down in 1945, how Stalin take control of eastern Europe in 1945 and America’s reaction to it, and the consequences of the Berlin Blockade. The podcast opens with a short explanation of the deteriorating relationship between the USA and the USSR through the Second World War. It goes on to present an overview of the two major Allied conferences – Yalta and Potsdam – and outlines the key agreements and disagreements that emerged from them. Opening with an extract from Churchill’s famous Iron Curtain speech, the second part of this episode explores the way in which Stalin extended Soviet control over eastern Europe to establish a ‘buffer zone’ of communist states around the USSR. 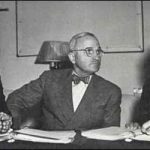 It then goes on to detail the USA’s response in terms of the Truman Doctrine and the Marshall Plan. Examples are given of each. 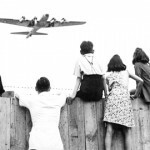 The third section of the podcast focuses on the Berlin Blockade of 1948-9. It begins with the background of the divided Germany after the Second World War. An explanation is then given of how Berlin became further divided between the communist and non-communist zones leading to Stalin launching the Berlin Blockade. 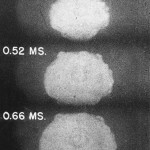 The Allied ‘air lift’ is then described. The episode finishes with some exam tips on how to answer a question about who was to blame for the Cold War in a balanced way. This video presents an explanation of the start of the Cold War. The end of WW2 presented the Allies with the problem of what would happen to liberated Nazi territory. 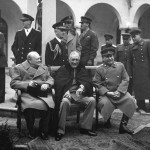 Stalin, Roosevelt and Churchill met at Yalta in 1945 to discuss these issues. 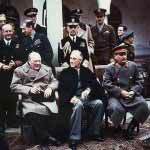 At Potsdam later that year the leaders of the USA (which was now led by Truman), Britain (under Atlee) and the USSR met again. The 16th July 1945 marked the start of the atomic age when the USA detonated the first nuclear bomb under the codename ‘Trinity’. 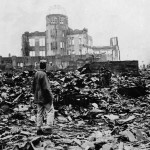 A short film outlining the early history of the atomic bomb, from dropping ‘Little Boy’ on Hiroshima in 1945 to the creation of an atomic bomb by the USSR in 1949. 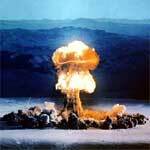 This video presents historical interpretations of why America chose to drop nuclear bombs on Hiroshima and Nagasaki. 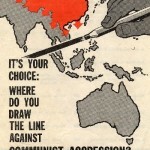 It also explains how it affected relations between the USA and the USSR.